It’s almost Valentine’s Day! Make this secretly healthy chocolate pudding for the ones you love (or the ONE you love the most- yourself!). My husband and I are not big Valentine’s Day people. We’re also not big birthday people, or anniversary people….are we the worst?? Let me be clear- I enjoy holidays and think they are fun! But when it comes to the gift giving and receiving, I just don’t get too jazzed about it. Sure I like getting gifts, but what I appreciate way more is quality time with my family. And flowers. I’ll accept flowers anytime. Ha! So for Valentine’s Day, I don’t think my husband and I have ever really gotten each other gifts. He can correct me if I’m wrong. But his memory is worse than mine, and mine is NOT GOOD. I know last year I ordered myself some chocolate online and told him that was his gift to me. So I don’t think that really counts. Anyway, my point is that I will make it a fun day for my three year old, and we will enjoy some treats, but that’s about it. Am I missing out on a true Valentine’s Day experience?? I may never know. I have been making this chocolate pudding about once a week lately, it is SO GOOD. It all started because Teddy suddenly stopped eating avocados, and I decided I had to do something spectacular to bring them back in his life. Because what is life without avocados? I originally set out to make a vegan frosting for cupcakes, but Teddy and I just kept dipping our spoons into it. We couldn’t stop! So I decided, why not just skip the cupcake and eat this like pudding? And since I’m the mom, I get to make the rules. Secretly healthy chocolate pudding was born! There are only 5 ingredients, all things you likely have on hand, especially if you’re an avocadoholic like I am. This definitely qualifies as dessert because there is sugar added, and I DO recommend adding the full amount of sugar here. I tried to get it to the lowest amount of sugar possible while still being delicious! It DOES NOT TASTE LIKE AVOCADO. While I love avocados, I don’t really want to taste them in my dessert. Just chocolate, creamy, goodness here! We love this secretly healthy chocolate pudding, and hope you do too. Eat it straight from the bowl, or fill raspberries with a dollop of pudding for a Valentine’s worthy red treat! **Updated to add: you can also make a no sugar added version using dates! Instead of using brown sugar, add 2 to 3 dates that have been soaked in hot water. Soaking just helps them blend better. With this version, I used my mini food processor. If you want to make this for a child under 2 years old, you might even get away with only 1 date, though it wouldn’t taste very sweet to you. 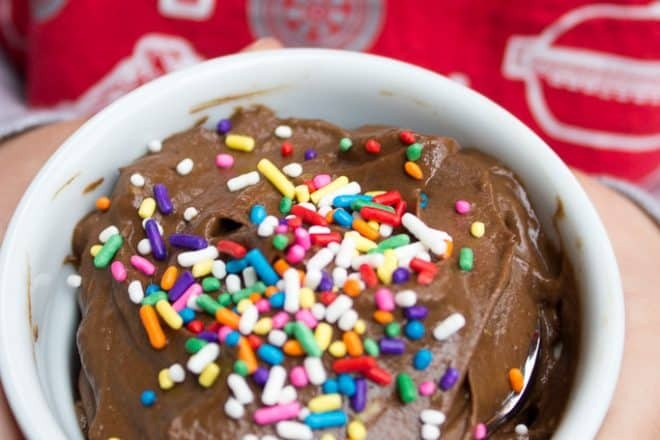 You might just fall into a daily pudding habit once you try this secretly healthy chocolate pudding! It is vegan and paleo friendly, lower in sugar than regular pudding, and has a dose of potassium, folate, and fiber from the avocado! Add all ingredients together. Use hand mixer, immersion blender, or mini blender to mix well. Serve! I tried this with other sweeteners and wasn't as happy with it. I do think brown sugar produces the best flavor! You can go up on the sugar by 1 tbsp if you want a sweeter treat.